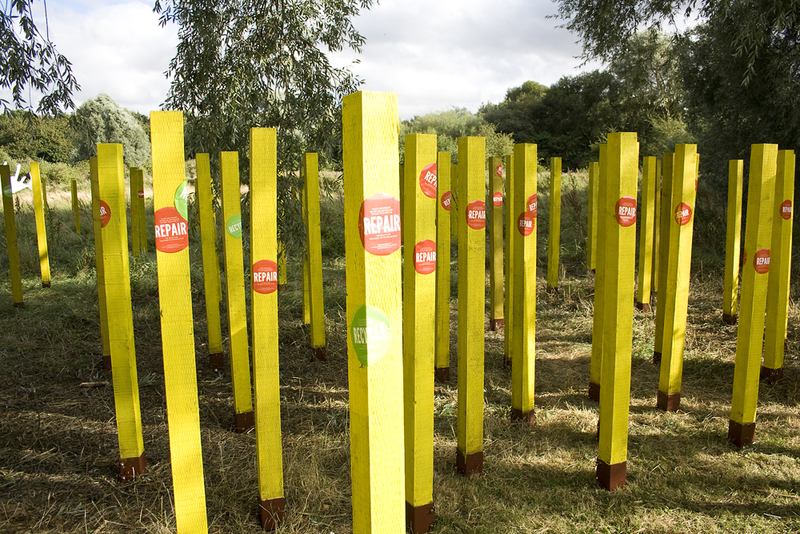 Commissioned by Peterborough Presents and Nene Park Trust with assistance from Metal, Peterborough. 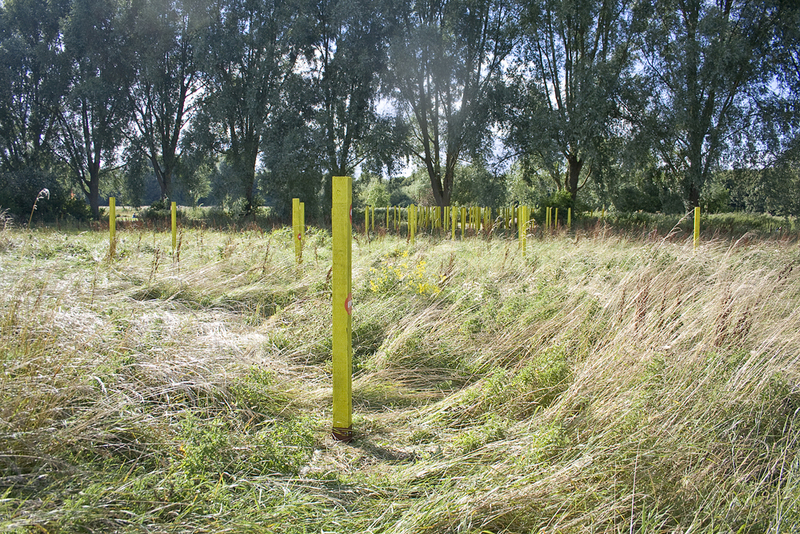 Five artists were selected to 'reinvigorate [the] substantial public sculpture collection at Thorpe Meadows by [creating] new temporary art works and interventions. 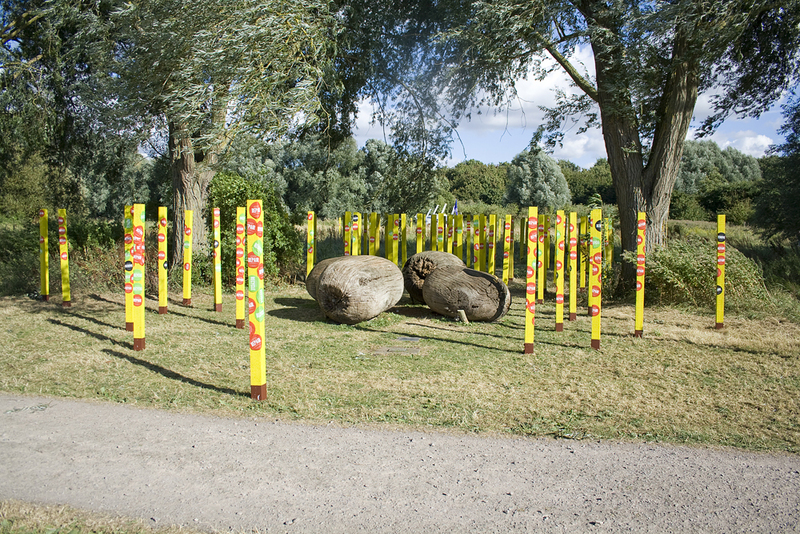 These resulting new commissions [were] showcased at a weekend of new festival activity surrounding the sculptures in August 2016.' The artists were: Lyndall Phelps, Jamie Gledhill, Store Projects, Scottee and Rich White. 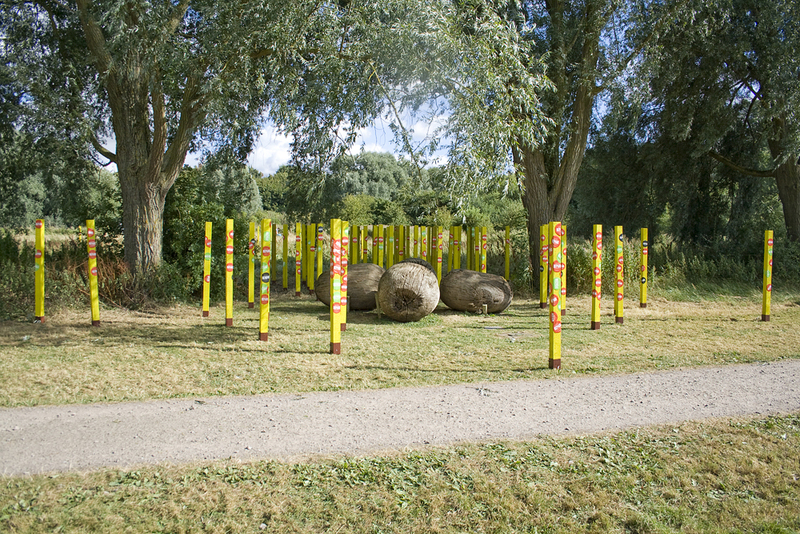 When first visiting the sculpture park the group were surprised by the condition of the sculptures. Some were damaged, some were made of unsuitable materials, some were sited or displayed poorly and some were altered without the consent of the artist. Initially the group was concerned by this. 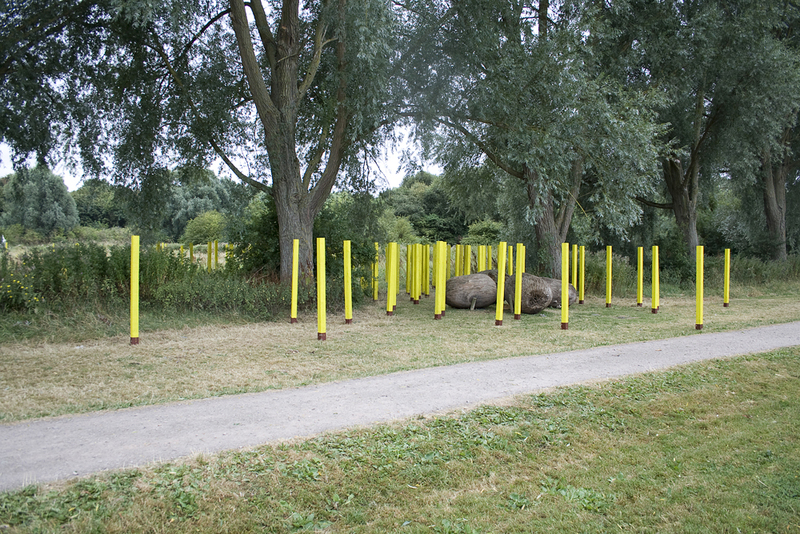 If the sculptures in the park were so neglected and unsympathetically treated what would this say about our work, which had been chosen to be shown alongside them? And how do you reinvigorate a collection that potentially requires so much work? 'I wanted to find out what the public actually felt about the sculptures; whether they knew about them, what they thought of them, and whether they wanted to keep them? To do this I chose to put one of the sculptures under threat, to see if reactions could be drawn out if it was presumed that something drastic was actually going to happen to a sculpture. 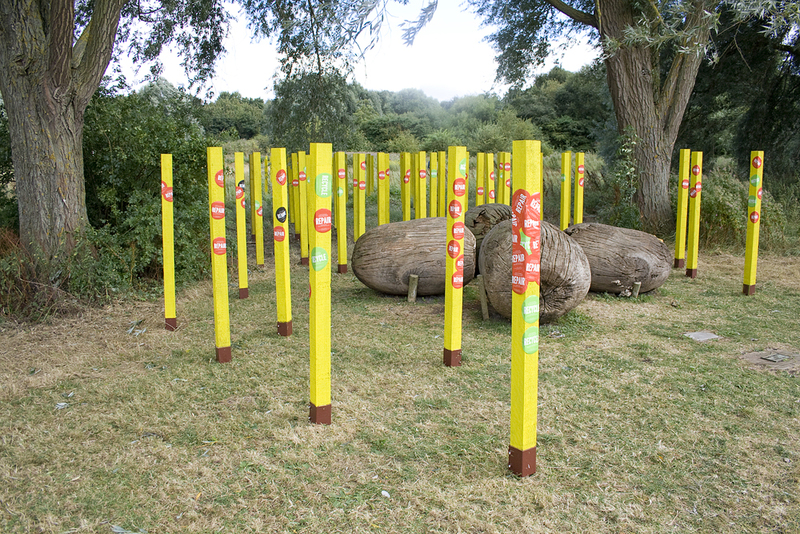 Due to its interesting life 'Odd Oaks' by Nicholas Pope was chosen. 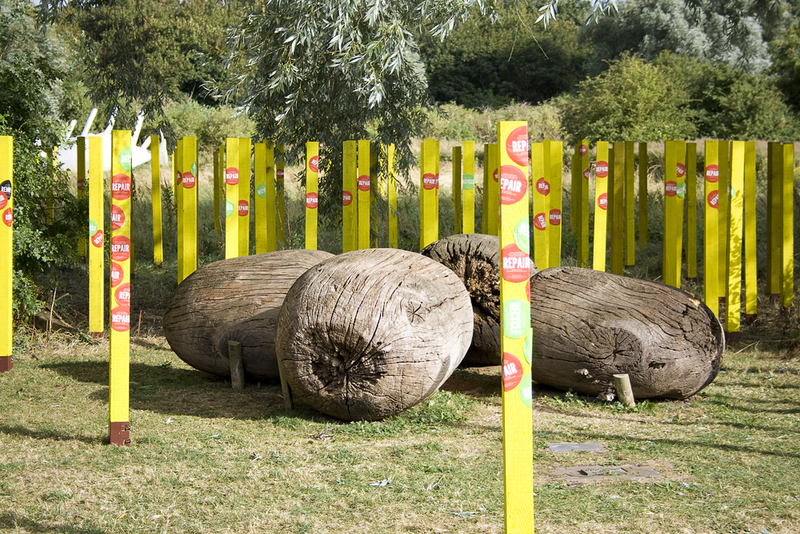 Originally sited in a Peterborough shopping centre in 1982 the work consists of four large carved oak 'acorn' forms that stood upright in a square formation. 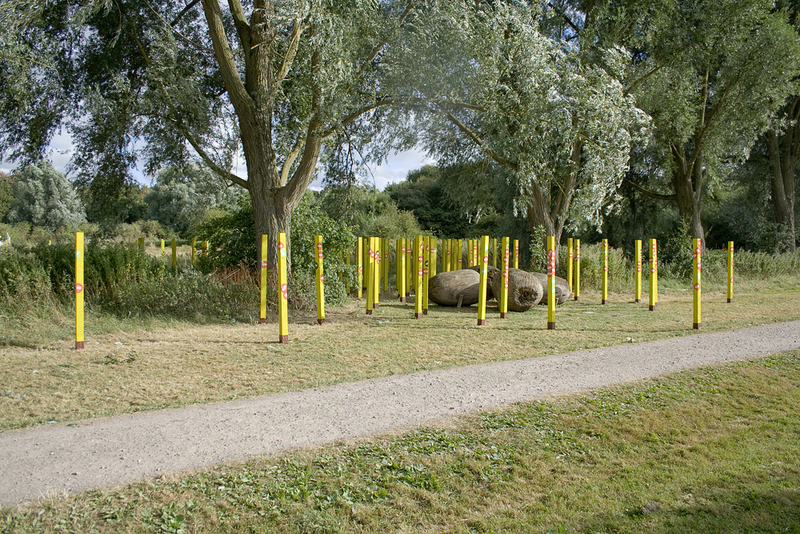 The sculpture was moved to Thorpe Meadows in 1988. Over the years the oak has aged and weathered, its once smooth surface has become deeply textured and the interior, which once slotted onto steel rods to hold them upright, has rotted away. In 2011 they were deemed too unstable and it was decided to lay the pieces on their sides and let nature take its course. The works now form the rather beautiful and intriguing sight of four aged oak forms slowly decaying; they have become a haven for small creatures and a point of interest for inquisitive eyes. Unfortunately, during a recent flood the pieces floated away. They were recovered and then rather casually staked to the ground to prevent it from happening again. This treatment of the sculpture was the ideal starting point to prompt discussions. 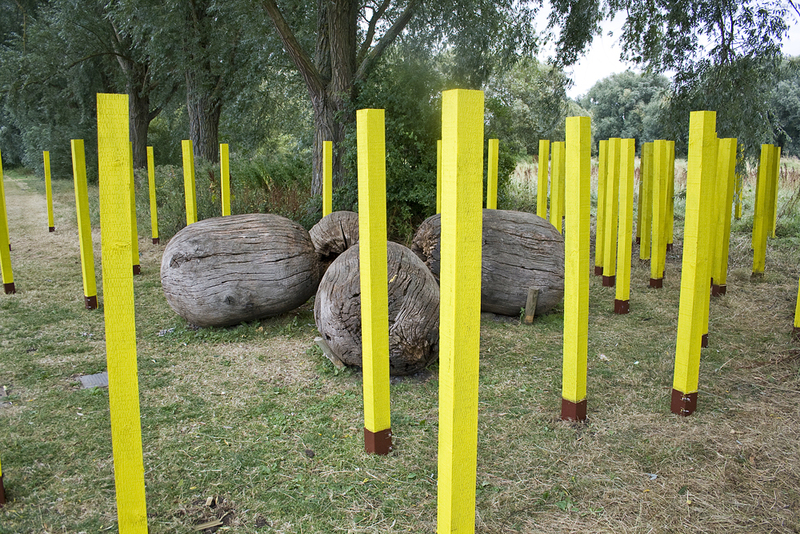 'In order to create a feeling of threat I devised an installation that swarmed around Odd Oaks; 100 bright yellow columns that, as they got nearer to the sculpture, got closer and closer together. 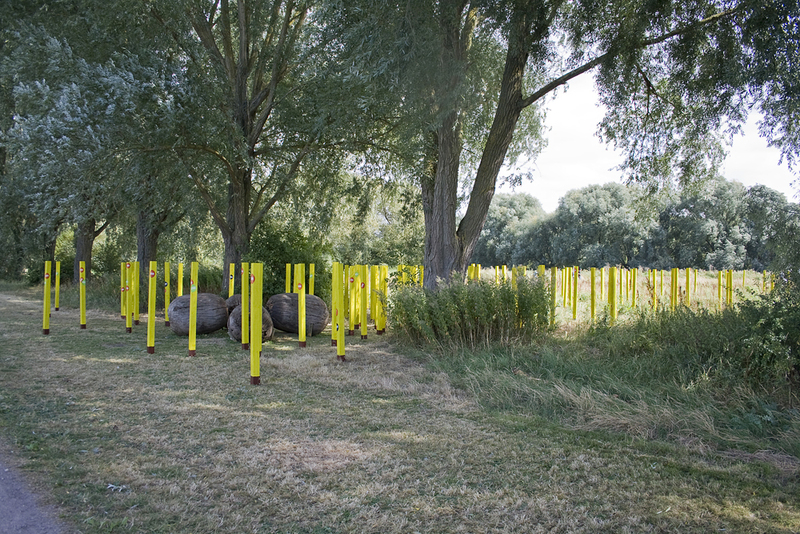 The formation of the columns could be seen as an attack upon the sculpture itself, or a defensive measure against other invisible, external threats. 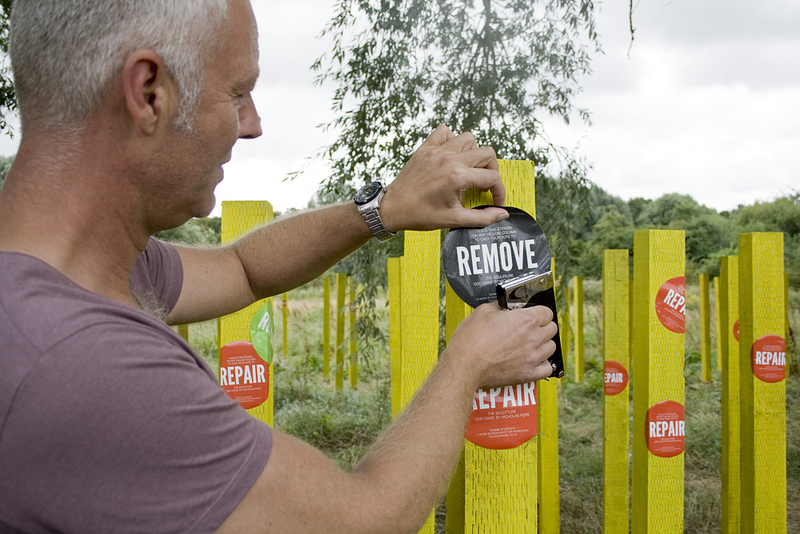 To provoke discussion visitors to the festival were invited to vote on whether to 'Repair', 'Recycle' or 'Remove' the sculpture by placing a corresponding sticker on any of the yellow columns. These also grew and spread as more people voted. 'The choice of three options limited what people could express but encouraged discussion about what each option could mean. 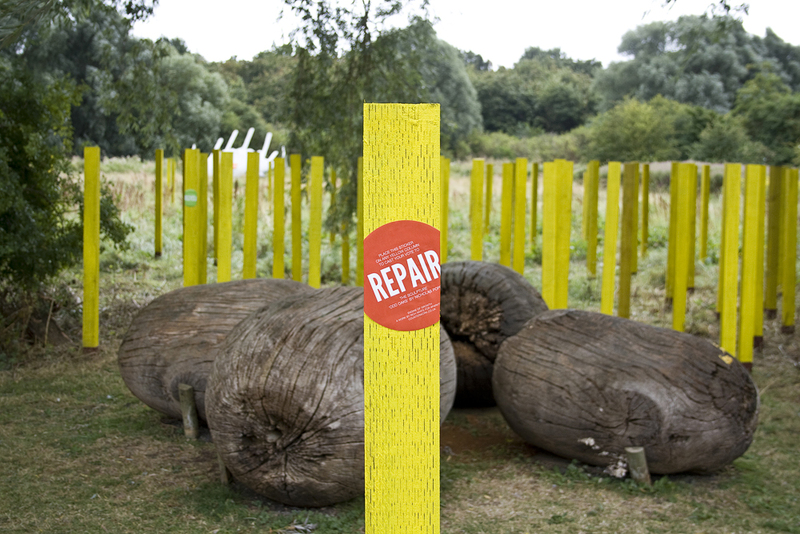 A lot of people just wanted the sculpture left alone, so we discussed the idea that 'Repair' could mean that we simply maintain the sculpture in its current state for as long as possible and ensure that it is presented in the best and most considerate way - removing the crude stakes and securing the pieces to the ground in a more concealed fashion, for example. 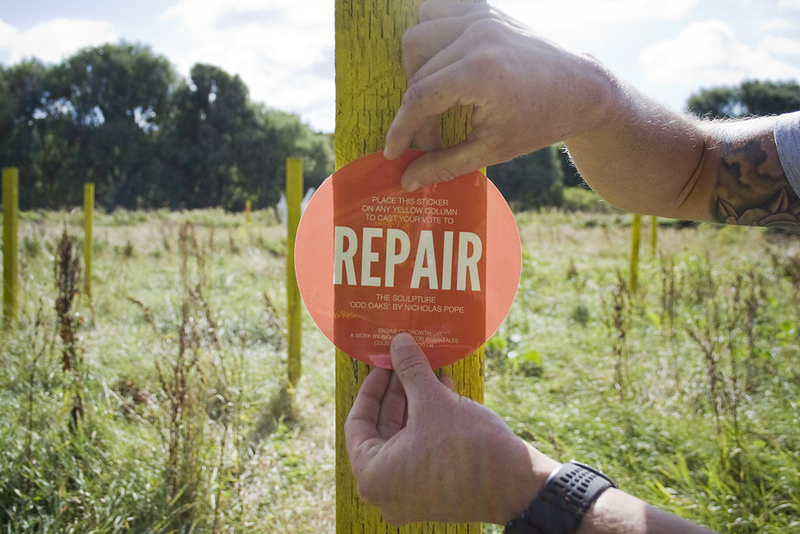 Others suggested repairing the sculpture using a technique similar to Japanese kintsugi where cracks in porcelain are filled with gold or other precious metals. In this case filling with clear resin or inlaying other wood into the cracks in the sculpture was suggested. 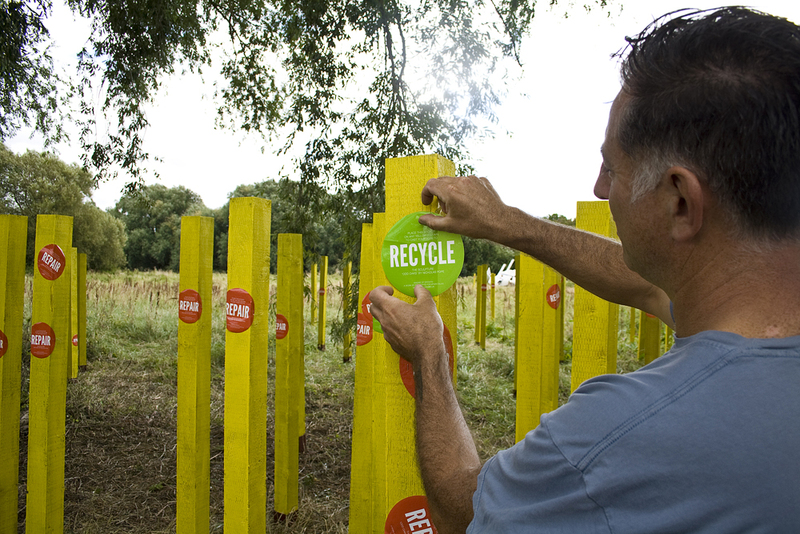 ''Recycle' revealed options ranging from using the pieces to make a new artwork, turning them into furniture, a boat or a climbing wall, to using them to make chipboard to build a house, pulping them for paper or turning them into charcoal for drawing. This option was very much about ensuring that whatever happened to the pieces they would go on to have another life or produce something useful. 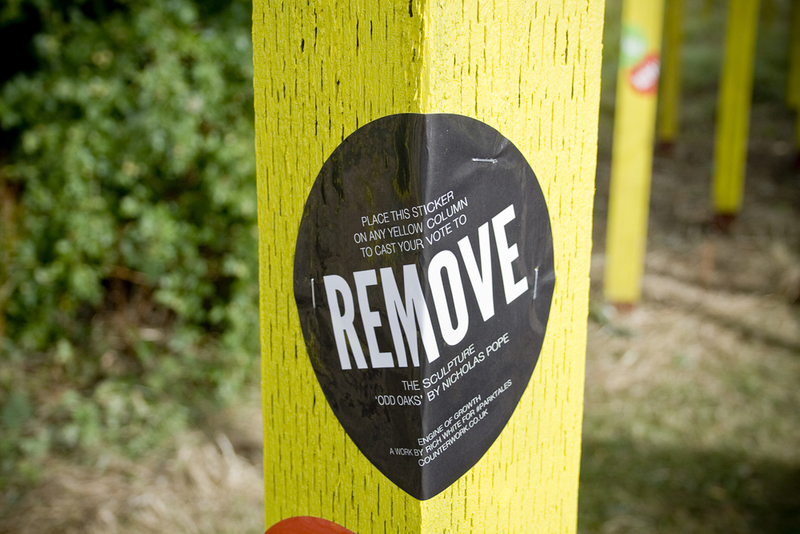 ''Remove' proved least popular and was initially seen as the negative and most threatening option. However, during discussions it was noted that if they were removed something new could be sited there, and that perhaps Odd Oaks had had its time. 'As both 'Recycle' and 'Remove' involved physically altering the sculpture it became clear that the majority of people were uncomfortable with the idea of destroying an artwork; that it was precious in some way and should be preserved. This enabled me to open up the debate and discuss the other sculptures in the collection. Not only were people thinking about Odd Oaks, they were also considering the conditions of the other sculptures and whether they too need to be repaired, recycled or removed. As these discussions went on it raised many questions about the artist's intentions and the treatment of the sculptures - do they care about what happens to the work afterwards? Was it their intention that it should slowly deteriorate? Should they be consulted if maintenance work is to be carried out, the work altered or decommissioned? Once again people felt that something was amiss if the sculpture was mistreated or the original artist wasn't consulted. They envisaged an invisible bond between artist and sculpture - a parental link that should be considered at all times. They saw the artist as becoming upset or distressed that their work had been tampered with or left to rot. I suggested that, although this is the case with some artists, others, after finishing a work, promptly forget all about it and move on to the next thing. This proved to be an uncomfortable idea and the sanctity of the artist-made object was the prevailing notion. This also led to discussions about when the artwork ceases to be an artwork anymore - or at least an artwork that can still be considered wholly authored by the original artist. Many people still considered Odd Oaks an artwork even though they accepted that the work had been altered and was no longer as the artist had intended. 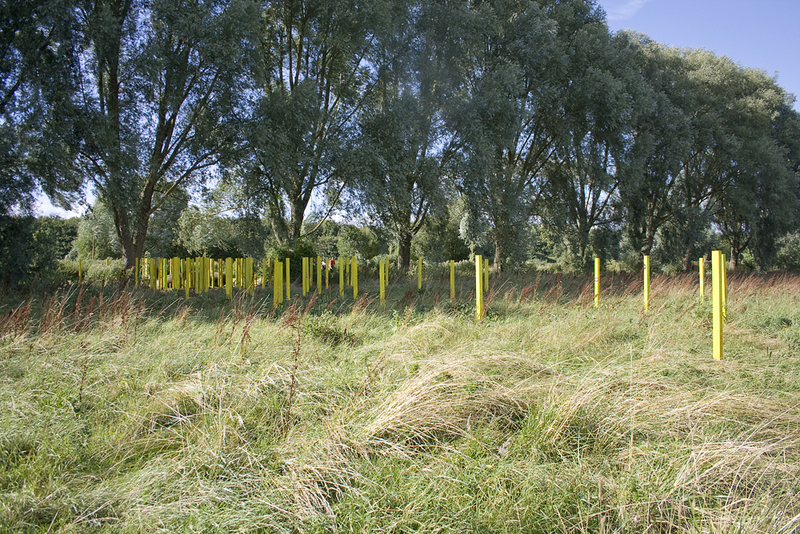 'Throughout the process of developing the work I was committed to making my installation a considerate and complimentary piece to Odd Oaks. 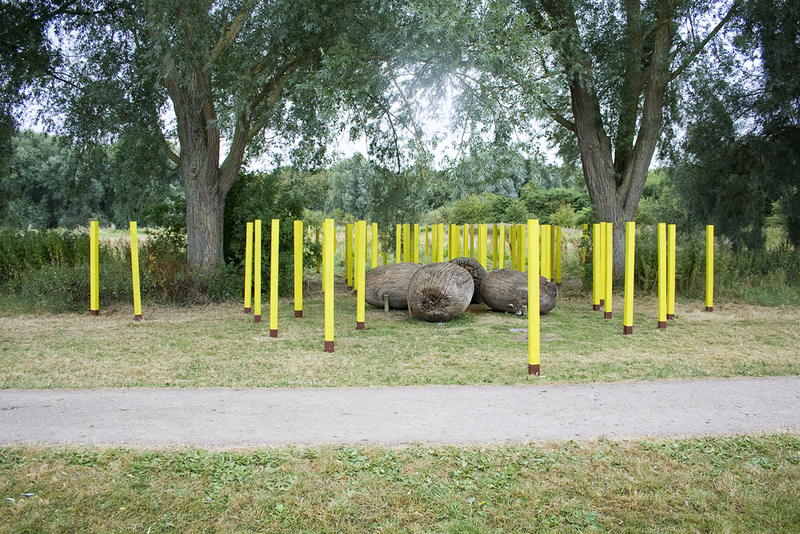 The installation served to highlight and draw attention to the sculpture. It was never about whether the sculpture was a good or bad artwork (in fact this never really arose during any conversations during the festival) it was always about the treatment of the sculpture and whether this was good or bad. 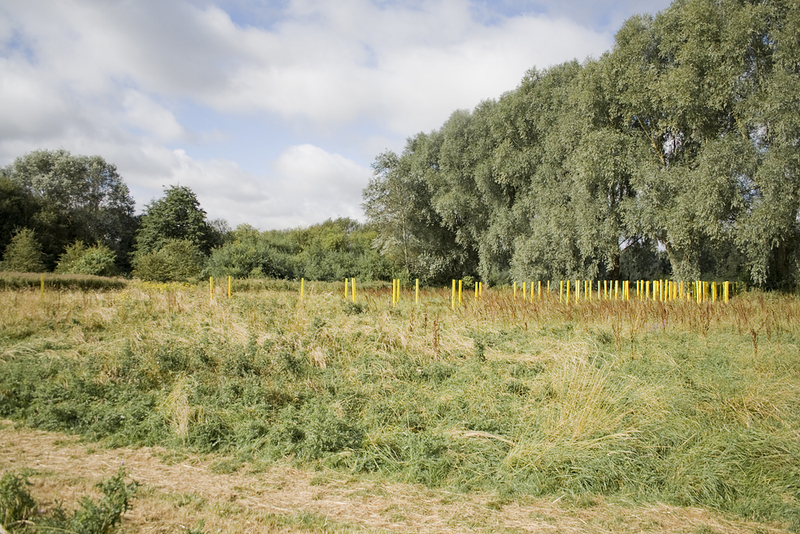 'Engine Of Growth' was a way of critiquing the maintenance policy of public sculpture in Thorpe Meadows and gaining a snapshot of people's opinions on how much they would like to see the sculptures cared for. 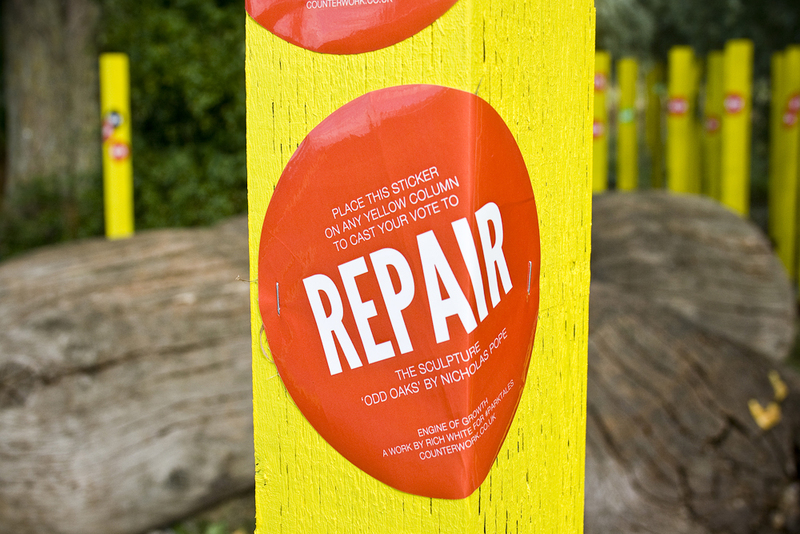 With nearly 300 votes for 'Repair' it seems an overwhelming majority are in favour of looking after the works. 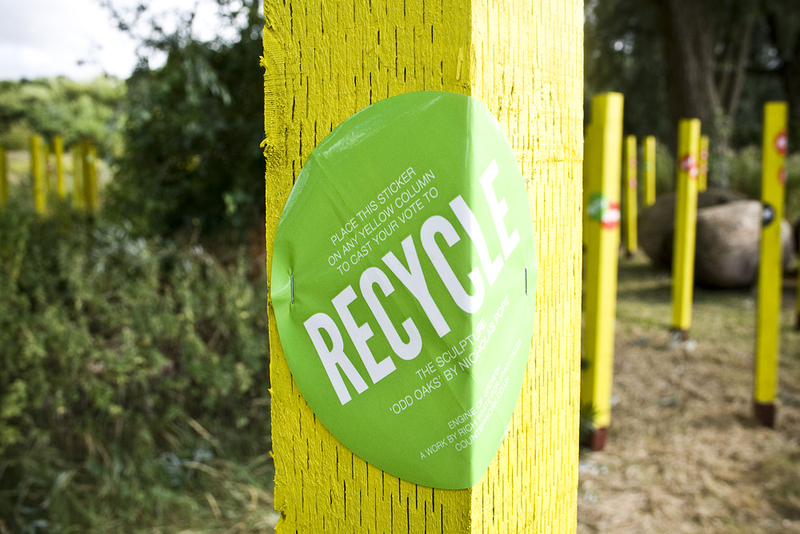 Approximately 50 would like to see aged or damaged sculptures recycled or repurposed, and only 12 want to see them go. Special thanks to Luke Payn, Bruce Fisher and Richard Ferris.